Mike, the old man I live with, gave me the name Cassie—the fourth name I’ve had during my short life. When he’s lying on his bed reading, or watching TV, I like to lie beside him and cuddle up as I did with my mom. Mike says I’m a comfort to him, because he has lived alone since his wife died. And he’s certainly a comfort to me, as I really miss my mom. 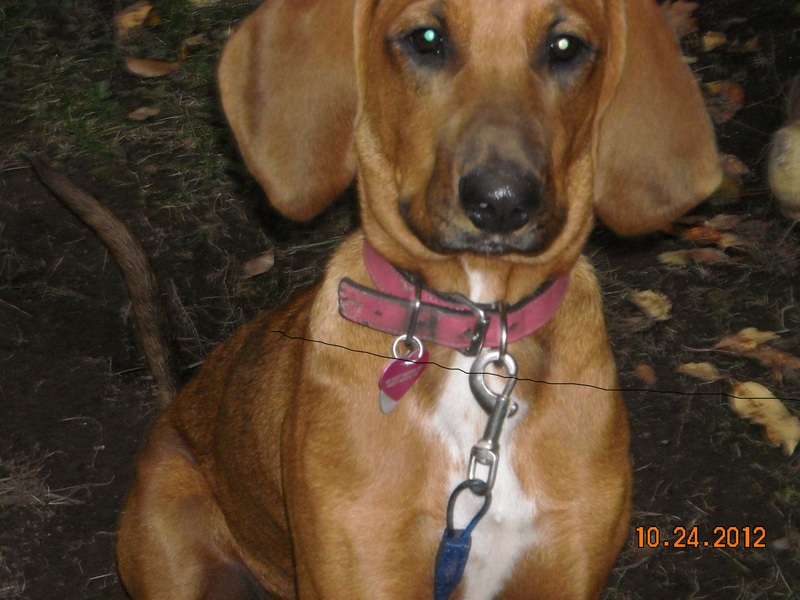 Officially, I’m a “Redbone Coonhound”—Redbone was the name of the guy who developed the breed. But Mike calls me a “redneck coonhound.” I came from the south—and Mike says that’s where the rednecks live. On a farm in Virginia, my mom had me and three other puppies. Then my mom disappeared. The rednecks said she had been shot in a hunting accident–because she looked like a deer. Mike says morons like that shouldn’t be allowed to have guns, and people shouldn’t be allowed to hunt. But I was bred as a hunting dog, and if people can’t hunt they won’t need hunting dogs. After my mom disappeared, I started exploring the edge of the farm. Then the rednecks rounded up the other three puppies and said they were going to try selling them. But I thought they would kill them like they killed my mom. So I ran into the woods and just kept running and running until I couldn’t run anymore. I started to get very thirsty. Eventually, I arrived at a place where there were streets and houses and people. They later told me I was in Siler City, North Carolina. A kind woman gave me some water, but then she called the dog catcher who took me to the county dog pound. At the dog pound, they called me Tallulah, or Lola for short. They said coonhounds were a dime a dozen in North Carolina and nobody would want to adopt me. “You ain’t nothin’ but a hound dog,” they said. Fortunately, they called a rescue agency that specializes in taking coonhounds for adoption in the Northeast, where we are seen as more valuable. Guess I got lucky because some wealthy guy in New York wanted a coonhound. Next day, they put me in a crate and drove me to Park Ave. and 72nd St., in Manhattan. The guy who adopted me was a Jewish hedge-fund manager who had married a blue-eyed blonde from North Carolina. His friends said she was his “shiksa.” He thought his bride would be happy to get a puppy from her home state. However, she had evolved from a southern farm girl into a Jewish princess. She would have preferred one of those rat-sized dogs like the one Paris Hilton carries around in her purse. And, for Park Ave., that might have been a more practical choice. They changed my name to Pippi. That was before I peed on their carpet, so I don’t know where they got the name. All the traffic scared me—especially the yellow cabs. I barked at the cabs, and tried to chase them away, but they just kept coming. Central Park was nice, but we had to cross a big street to get to it. My owner finally conceded that midtown Manhattan wasn’t the best environment for a hunting dog, so he had the agency take me back. The agency wanted to keep me in the Northeast where I had a better chance of getting adopted. They persuaded a lady named Leslie to be my foster mother until I could get adopted again. She lived in a nice house in New Rochelle. It had a large fenced yard and I could play all day with my foster brother–a black-and-tan coonhound, adopted from the same agency. They changed my name to Krissy. I wished I could live there forever. But a husband, two toddlers, and two dogs were too much of a burden for Leslie. She made a video of me playing ball, and her godfather, Mike, saw it and decided to adopt me. That’s how I wound up living with Mike in Connecticut. He changed my name to Cassie, and figured the two names sounded similar enough that I wouldn’t get confused. I’ve lived with him for over a year now—and that’s much longer than I lived anywhere else. Now we can comfort each other until one of us dies. This entry was posted in Memoirs, Stories and tagged dogs, hunting, rescue agency by mikeelphick. Bookmark the permalink.